Habit: Encyclia gracilis grows as an epiphyte or terrestrially among leaf detritus and rocks. It produces a very short rhizomatous stem that is covered with secondary stems that are expanded to form elongate pseudobulbs up to 25 cm in length. From the top of the pseudobulb flattened linear leaves emerge that are up to 1 meter in length. The pseudobulb can be a purplish color. The zygomorphic flowers are arranged in terminal panicles up to 125 cm in height and contain 30-45 flowers that are produced in the spring between November and February. The flowers have bracts and the calyx has three greenish-yellow sepals that turn brownish with age. The corolla has three petals with one forming the labellum. 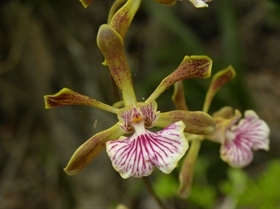 The labellum is three-lobed, starts yellowish-white but develops reddish-purple lines as the flower ages. Two lobes of the labellum wrap around the greenish-yellow column. The column is formed from a fusion of the stamens and ovary into a single structure. The ovary is inferior. The fruit is a capsule at maturity up to 4 cm in length that opens along six suture lines and hangs allowing wind to assist in seed dispersal. Habitat: Encyclia gracilis occurs in Dry Broadleaf Evergreen Formations – Forest/Woodland/Shrublands (Coppice) that have a mixture of species or are palm- dominated. Distribution in Bahamas/Globally: Encyclia gracilis occurs on all islands in the Bahamian Archipelago. It is considered endemic to the Bahamas. Medicinal/Cultural/Economic usage: While there are no medicinal uses of Encyclia gracilis, like all orchids they are prized for their beautiful flowers. ALL orchids are protected internationally by the Convention on the International Trade of Endangered Species (CITES) and should not be collected from the wild.